As one who lived in NYC for a time, I know the dreaded hot dog debates. I simply know to order and keep my mouth shut, except to eat. Great review of Jerry's and I will have to send J. over to check it out. I wonder if there is anything they could do to extend the life of the potatoes. It sounds like they need to flash fry or do some sort of pre-cooking treatment to the potatoes before frying. Also, thanks for the sing-a-long. Any baby boomer kid knows that song. 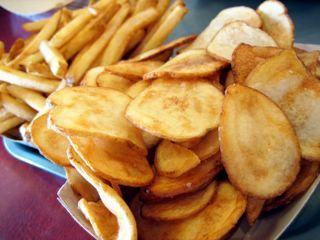 Yeah...not sure what they can do to improve the crisp quotient of the chips and fries...perhaps they might need to just fry harder and longer. And I love Jerry's. I try to race over there from my office once in a while for lunch.. Thanks Kimberly! This place is great ain't it? Hi Elmo - On some days there's nothing better then a "good dog"! You got that right Kirk. Hot diggity dog Elmo, now I want to go to Costco and grab me a hot dog and soda combo! I wanted to tell you, that I met up with Eat, Drink, and Be Merry not too long ago, and we talked eagerly about you (and also Kirk and Pam). We have such a deep and incredible appreciation for your contributions to the food blogging community, and your writing--whew! Again, the only words that aptly describe your ability to cripple me and make me hungry like an insane beast, is again, "hot diggity dog!" Thanks so much for those kind words. I have to return the compliment to you as I am always in awe of your writing, more so than others should be of my stuff. With all this talk of blogs vs. newspaper reviews, and criticism of food blogs, sometimes I wonder when everyone forgot that this is supposed to be fun! You said it. When it all stops being fun, then that's when we have to worry. Sorry to have brought it up. I guess I was dizzy from reading about the controversy. This and the recent disappearance of Mealcentric has gotten me disoriented. I wonder what's happened!? His blog vanished into the ether two days ago and today it seems that someone else has hijacked his address! But the good news is that I also I heard from Diamond Dog of Eat OC recently. He's thinking of going back to blogging after an absence due to personal problems he faced last year. I hope he does! It's getting lonely in the OC food bloggin' scene! Great post! I totally agree with Kirk: "Can't we just all get along???" Seriously. Along with hot dogs, BBQ and pizza always tend to stir things up also! Hey, and I just read your comment about Mealcentric! Bizarre--what's up w/ that??? I did send MEalcentric an Email - and suggest you do the same. I do miss His insightful, and entertaining posts. He did respond to my Email on Thursday. You got my stomach rumbling with your description of the dogs and all the fixin's. And fries as just a palate cleanser? I can't believe that! I think I just ate my last Costco dog. BTW, I was flabbergasted at MEal's disappearance too! What was up with the hijacking of his name? If anyone's heard from him, could you pass along any info? Please let him know that he's missed very much. Ahh the great New York thin crust versus Chicago Deep Dish debate...forgot about that. Thanks for writing in! I think you will be quite pleased with Jerry's. But hey, Costco dogs are pretty darned good too! Thanks Kirk for the info about Mealcentric. I haven't contacted him yet, but hope he'll be back soon! Glad that you heard from Diamond Dog, BTW! I still check His blog every day or so in hopes of a new post. Me too...hopefully he decides to jump back into it soon. - your uber nerd of an online food friend! Driving the Weinermobile, isn't that Homer Simpson's live-long dream? PCH Dogs? Cool! I forgot about that place. I remember Gustavo Arellano reviewing it in OC Weekly. Yeah give it a shot. they make a chicago dog the right way, too, IMHO. thanks! finally, another good sausage place i can check out. there's one other hotdog/sausage place in the OC area that i go to during lunch hours. It's called Haute Links. If you got time, check it out. It's pretty good. Hey thanks for the tip, that's only a few blocks aways from where I work! 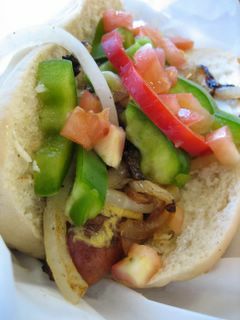 i went to the Jerry's Dogs in la habra over the weekend and decided to start with the Signature Dog. the wood-fired process did make a difference--it was a darn good dog. but to me, the best dogs are always from those street vendors. maybe the messiness factor adds to the overall psychological impact. to me, the most unforgettable dog always happened when i was shivering in the cold. a good dog provides so much comfort. I went to Jerry's yesterday. The food is okay, but the prices are absolutely ridiculous. I had a hot dog, some onion rings, and a cheeseburger and it cost me over $13. Stay away unless your pockets are overflowing with dinero. Yup. This place is pricey considering you can get a hot dog and soda from Costco for $1.50. But then, a mom-n-pop like this can never compete with Costco or Wienersnitchel. The fact that we zoom in on prices and nit-pick on pennies is exactly why the independents are dying, and Walmart rules the world. Welcome to the future folks. We made it this way. Congrats. Completely with LehoCanto on this one. Is it a good hot dog? Yeah, absolutely. But when I went they were out of basically every single topping (no coleslaw? No sauerkraut? How is this even possible?) and though I don't mind paying for quality on occasion, the hot dogs weren't something so mind-blowing that I'd go again for how much I paid. The burger was so-so and overtly salty. I'm a poor college kid too, so sue me for wanting some decent food for cheap. Jerry's was okay for a spin but doesn't really warrant a lot of return visits on a tight budget, and I have no clue why some people are so adamant to defend it and turn it into an argument about the cruel dark hands of corporation taking over. As for me, I could go for a Costco hot dog right now. Have fun.